Coming up in September is 5Zero, Bright’s newest bike event, a 50km Gravel Grind loop with a strong environmental theme. Obviously I’m signed up, so I took an opportunity to recce the 53km course a couple of weekends back. I skipped the opening sally that all three rides take in – I’m very familiar with Mount Porepunkah Road, which climbs on smooth tarmac out of Bright, before giving way to rough chipseal and then outright gravel. On the day, that will be a harsh wake-up call for the riders, up to Quins Gap. After that, the routes go over Tom Briggs Road overlooking Porepunkah. I’m also pretty familiar with that section, so skipped it on my reco. There’ll be a lot of burning legs on the day by the time riders curve around the western tip of Tom Briggs and start heading downhill for the first time. The riders then sneak around past Porepunkah’s water treatment lakes and onto Roberts Creek Road. 13km riders will throw a left here and head back to Bright via the Murray to Mountains Rail trail. Everyone else will turn right into Porepunkah and cross the Great Alpine Road at Porepunkah Bridge just near Buckland Roundabout, where the dirt -and the climbing – starts again. There’s a short nasty firetrail climb up into the pines right after the road, which can be bypassed in quite a fun way by some singletrack that winds through the pines to its left, look out for the entry to the singletrack on your left, it’s quite enjoyable. Riders will then drop back down towards Buckland Valley Road before taking a hard left onto Longly Road. It’s all gravel from here until the 38km riders get back to Bright, or until the 53km riders reach Wandiligong, so get settled in. There are some rather nice views over Buckland Valley from here, if you care to look back. Depending on how you’re treating the day though, you might be head down, smashing towards Royal George Road. There’s some more climbing here, and at the top a slightly confusing left turn downhill. Don’t turn hard left and head up the crazy steep bit – instead roll downhill a little way and take the switchback downhill. Even with the GPX file running on my bars, I nearly messed this up and my Garmin didn’t tell me until I’d slogged a decent distance up the steep climb. You’ve got a few pleasant downhill kilometres now until the next corner, which is much more obvious on the GPX file, leading to some more down-then-up action taking you eventually to Dingo Ridge Road overlooking Buckland Valley. Now you’ve got an easy time of route finding until you reach Moran Road, where all riders will turn left and head up to Clear Spot lookout. I believe there’ll be a support station here with water and food, which will be a welcome sight indeed. After Clear spot, the routes Diverge again. The 38km riders will drop down off Clear spot by retracing their steps to Dingo Ridge Road, doubling back around Eagle Peak and turning right to descend into Bright, where they’ll emerge onto Bakers Gully Road and Ireland Street, and from there back to the Brewery for a well deserved beer. 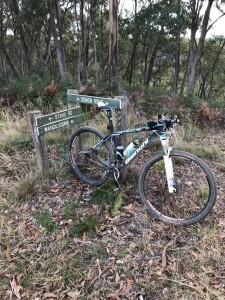 The 53ers, however, will continue left after leaving Clear Spot along Moran Road to Demon Ridge Track, which is followed until you spot a sign for Stans Road and Wandiligong. Fork left here, don’t continue onwards or you’ll be pedalling a lot longer than you need to. A nice brake-boiling descent into the valley ensues from here on, and you’re soon dropped back onto tarmac at Morses Creek Road. The parched may stop at Nightingales produce store for some apple-related energy top-ups here before hopping back on and heading towards Wandiligong proper. Unfortunately, the official route doesn’t take you to Wandi Pub, as you turn left on Centennial Avenue before you get there, however clued-in locals will know about some extra gravel trail from Royal Bridge Track just after Wandi Pub, via the Chinese Bridge to rejoin Centennial Avenue near Alpine Park. I’ll be tempted to go that way after a refreshing ale at the pub, if I’m not worried about losing time. At Alpine Park, we head left up a short steep pinch to join White Star Road. Local MTBers will be familiar with the trails around here and might optionally throw in some singletrack. We then go under the road and follow Morse’s Creek back to town via the Caravan Park and join the other triumphant riders for a post-ride beer. My recce ride wasn’t particularly quick, but took 3h40m. I stopped for a fair few pictures and treated it as a pleasant afternoon out rather than a suffer-ridden slog. On the day, it should be a bit quicker. Those on mountain bikes will likely be a bit slower than dedicated gravel grinder owners. A road bike capable of running 30c tyres or larger should cope fairly well, though the final descent of the 53km might be a little hairy. I’m running my road bike on 28c tyres for the Tour of Beechworth in July, but I don’t think I’ll be risking that setup for 5zero. I’ll most likely be on my 29er hardtail for this one. There’s still time to get entered for the event, so sign up now! Continuing my vow to post some interesting rides, here’s a local loop out of Porepunkah or Bright which is a pleasant couple of hours out on gravel – good for an MTB and also excellent if you happen to have a gravel grinder or CX bike in the stable. The embedded strava ride starts out of Porepunkah, which is home, and takes the Rail Trail towards Roberts Creek Road, a slight uphill that features in the Tour of Bright TT course. It continues over the bridge and along a short stretch of gravel to a short, sharp tarmac climb up towards the crest at the start of the Apex walking track and the junction with Mt Porepunkah Road. There’s a nicer start to this, if there’s no logging or maintenance activity, taking Tom Briggs road over the shoulder, which brings you out at the same spot – the foot of the Apex walking track. If there’s logging or maintenance activity going on, I’d strongly advise staying off that trail though. If you’re coming from Bright, you can get to the same spot via a steep road climb, ending on gravel, by turning off Back Germantown road at Mt Porepunkah Road. At this point, you head Northeast and downhill along Mt Porepunkah Road for maybe a kilometre before the climbing starts. From here it’s a fairly constant 15km climb through the backcountry. There are no real pinches or challenges, but the climbing is fairly constant. 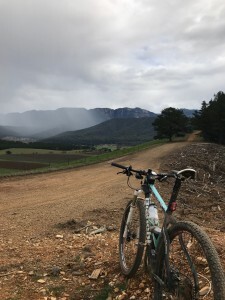 Eventually you’ll pass a signposted junction with Smart Creek Track, which would take you down to Kancoona Road and offers a possible return route to Tawonga Gap – a ride I’ve got my eye on for later. 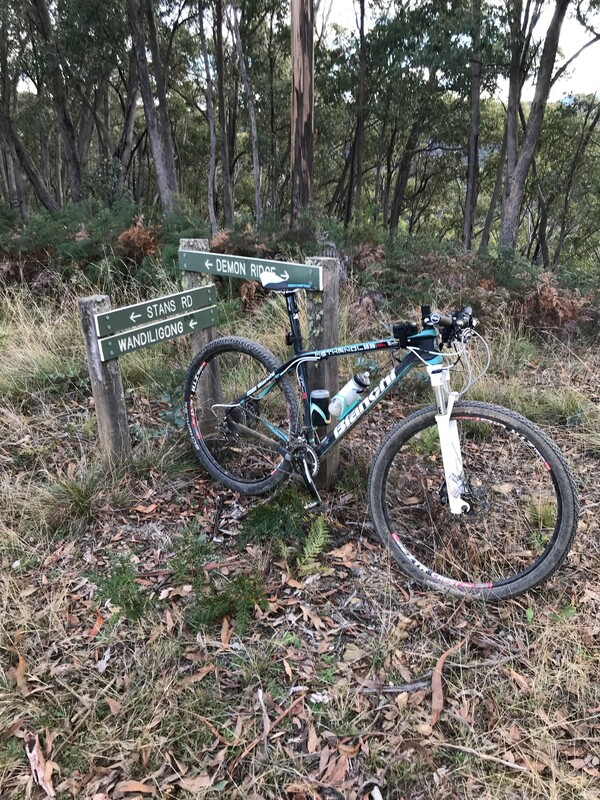 At about 11.5km from the Apex Track junction, you get a sharp, signposted left turn that continues upwards, and at about 14km from Apex, another left turn allows you to head either up to the bushfire lookout tower, or head downhill to the finish. I’d advise heading up to the tower, because there’s a lovely view across to the Mt Buffalo plateau and a good spot for a break and a bit of a munch (you did bring some food, right?). From here, retrace your steps back to the junction, where you turn left and start down a good old fashioned rocky downhill. On my first expedition, I met with a couple of 4WD vehicles on this descent, so take care with who you meet and how you ride – don’t go blind into corners, because this road is used by vehicles, especially in the summer months. Eventually you’ll pop out of the trees onto One Mile Creek road, which heads down and meets the Great Alpine Road and the Rail Trail. If you turn right here, you’ll find Boynton’s Winery. If you turn left, Ringer Reef winery – both are great places for a post-ride snack and a glass of wine – and thence to Porepunkah, completing the loop. This is a splendid little afternoon out on the gravel – not too challenging, not too long and not so far from civilisation that you’ll need to pack a ton of kit. If you’ve got a few hours free and feel like some firetrail rolling, I’d say check it out. 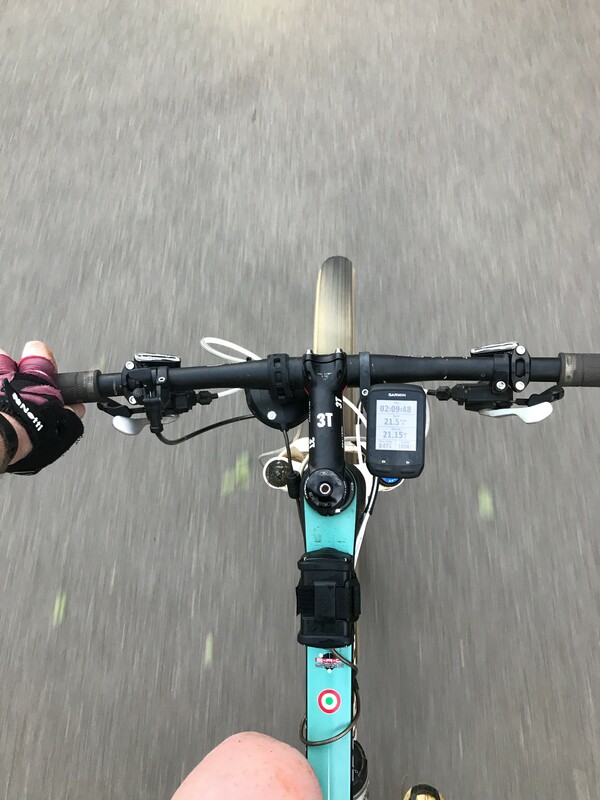 I have resolved to blog more in 2018, and as part of that, I thought I might post up some routes I’ve ridden, or that I’m planning to ride, with a map and a description. I thought perhaps I’d start with a short-ish evening MTB ride in my new neighbourhood. 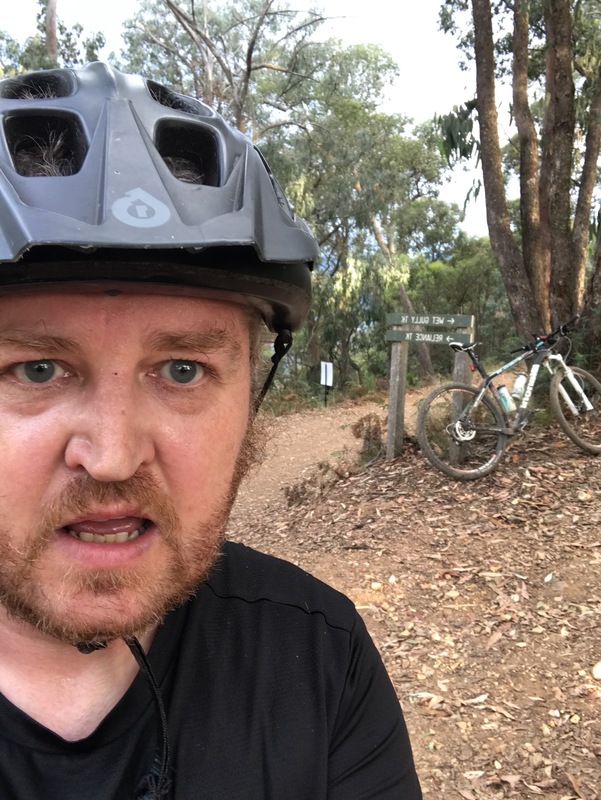 At this point, you’re officially into Mystic Mountain Bike Park, and there’s a plethora of possible routes out to Wandi, ranging from the road, the bike path or firetrail and even tricky singletrack. 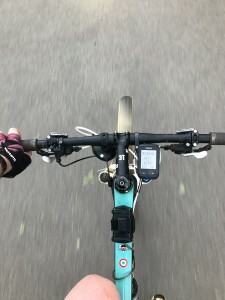 I mixed a few up, starting on The Highway, then Flying Solo, then a little firetrail which dumped me out onto the bike path, which I followed into Wandi, then round Centenary Avenue to Wandi Pub. Opposite the pub, you turn onto Growler’s Creek Road, which is where the ride proper starts. I called this ride “Banjo Country”, for no other reason that riding out along Growler’s Creek Road from the Wandi pub and vanishing into the bush does feel a little… backwoods. You follow that for a bit over a kilometre until you reach Hillsborough Track on the left. This is the beginning of the proper climbing, about 350m (or thereabouts) of it, from about 400m above sea level to a little over 700. In the early part, you cross a couple of creeks and start climbing in earnest. On the evening I rode it, the lower part was a little sticky from a short spell of rain, and the track had obvioulsy been churned a bit from 4WD traffic, and there was definite evidence of heavy machinery, which made going a bit rough and slow. The humidity was fairly punishing too, but this would be fantastic on a drier, cooler day. You climb steadily until just under half height, at which point you find the first of a series of hairpins which zig-zag you up to about 650m elevation. This was probably the smoothest going of the ride, as the very last section, after a hard left turn, brings a less consistent gradient and some decent-sized loose rocks, which made climbing a little tougher. However the gap soon appears ahead of you and it’s a last blast to the junction with Wet Gully Track and the Reliance Track, which is the chosen descent. Reliance Track is pretty steep, and with a fairly loose surface, which would make it very tough going in the opposite direction, but heading down is fun. I guess it’d be more fun with full suspension and 200mm discs. I did it on my XC hardtail, so kept the speed down to avoid boiling my brakes too badly, but in the lower sections the surface firms up, the gradient evens out and there are some fun waterbars to catch a little air from, before you fly happily down past the Bright Storage reservoir and onto Great Alpine Road. From here, turn left and then shortly afterwards head right onto Old Harrietville Road for a quieter road experience. Once at the end of Old Harrietville Road, you have the choice of turning right and then left onto Back Germantown Road, which will take you back to Bright, or just taking the main road into town for refreshment. In my case, I hopped onto the Murray to Mountains Rail Trail and followed that back to Porepunkah Roundabout, at which point I reprised the Porepunkah riverside path back to the bridge. This is about 40km round trip – about 30 if you start from Bright, and takes in a nice middle-sized climb over the ridge back into the Ovens Valley. There’s an alternative version of this that starts further up Morses Creek Road from Wandi, and drops you out at the old Harrietville Cemetery, but that’s a story for another day. And besides, it may be better ridden in the opposite direction, so I’ll save that one. So that’s what I got up to the other night. More to come later.